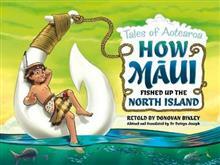 Donovan Bixley re-tells the story of Maui fishing up North Island! The traditional tale but with Donovan's unique twist and trademark humour. The pictures will be bright and bring their own level of humour to the book. Darryn Joseph will ensure that the story is accurate and culturally appropriate, and will translate the story for the Te Reo edition.